I'm getting worried over my blood pressure. For the last few days, my average blood pressure is 140/100, and it is already at the high blood region. I was only able to know this because of my medical exam for SMART, and now I am quite pressured in lowering it at the soonest possible time. Having high blood pressure means that I am not fit. This surprises me since I feel just normal, with no complaints. I don't even look like a person likely to get high blood. Perhaps I may just be too stressed after all the job interviews I went through, the QC-Taft/Ayala trips and also because of this end of sem madness. 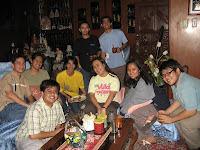 Yesterday, the cool guys together with IML faculty went to Bryann's house due to his invitation for dinner. Sir Bryann just received his delayed UP instructor's salary and so he decided to sponsor some sort of dinner bash. It was pretty nice to have some bonding moments again with the IML faculty, although SirRichard is no longer present since he is already puruing his Phd studies in the UK. We played poker with Ma'amJoy and Ma'amTess, while SirMarc jammed with Arnold and Gian in the background (with the use of 2 acoustic guitars and a K-hon), Ma'amTata and SirFranz just observed the poker game. Despite me having the high blood syndrome, I did not stop myself in eating lechon from the dinner table. The food was actually plenty for all of us to eat, too bad I was a bit restricted at this time. After the faculty left, we jammed with Bryann's karaoke machine. 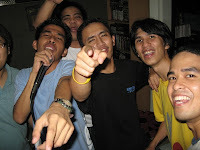 I think this was the very first time I indulged myself in Karaoke singing. Perhaps because all of us were guys, that it's okay to sing wildly. I really had fun last night. Although that event cost me precious sleep time, I felt unstressed. I really believe that having fun would give me my best medicine. I'm really really looking forward for more 'outings'/bonding moments such as this. Friends, where art thou? Let's get it on and have some unadulterated fun!